Widespread in Brunei. Also in Sarawak. Endemic. 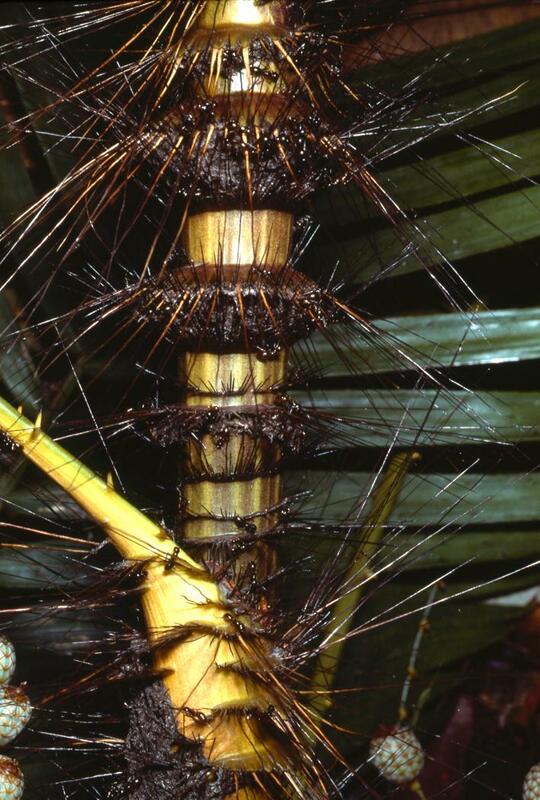 Slender to moderate, solitary or clustered ant rattan, climbing to 20 m; stem without sheaths 8-10 mm diam., with sheaths to 20 mm diam., internodes c. 15 cm long. 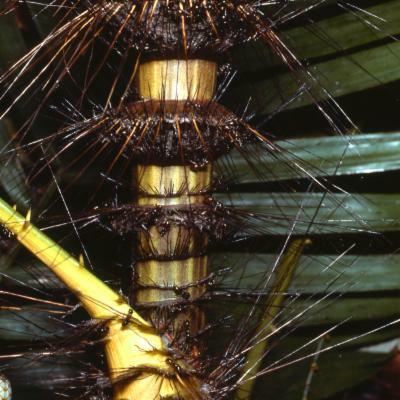 Sheath shiny green, reddish-brown tinged when young, bearing several collars with long horse-hair-like black spines to 8 cm long, 2-4 pairs of collars interlocking to form ant galleries, the spines bearing deciduous brown indumentum. Leaf cirrate, to 1.5 m (usually less), including petiole 25-40 cm and cirrus to 60 cm; petiole bearing groups of short spines to 4 mm, at the base intermingled with longer horsehair like spines; leaflets c. 20-50 on each side of the rachis, very close and regular, stiff, ± parallel-sided and abruptly narrowed at the base, the longest to c. 22 × 1.5 cm, usually narrower, conspicuously bristly on 3 veins and the margins on the upper surface, very sparsely bristly beneath. 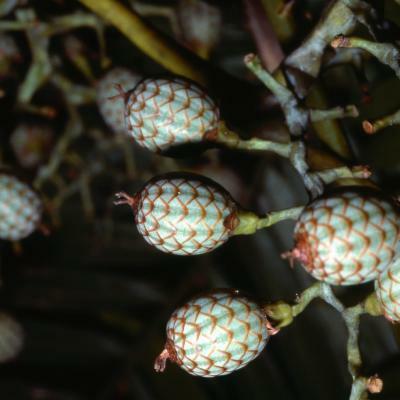 Inflorescences short or of moderate length, 15-30 cm long, peduncle short, unarmed or only very sparsely armed; prophyll and primary bracts deciduous, usually bearing horse-hair-like spines; flowers rather conspicuously stalked. 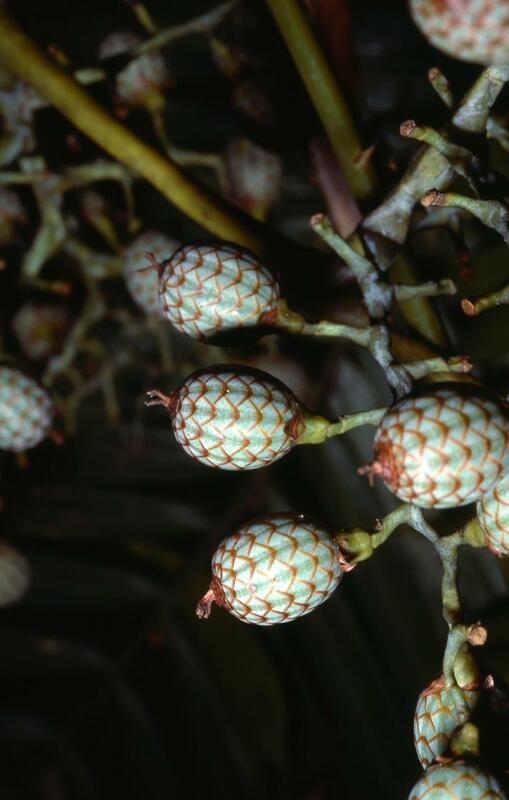 Mature fruit rounded or slightly obovoid, c. 14 mm diam., very briefly beaked, covered in c. 15 vertical rows of pale brown scales with darker margins (pale green with reddish-brown margins when immature). Seed rounded, c. 10 mm diam. ; endosperm deeply ruminate. Seedling leaf pinnate with very fine close leaflets. (Fig. 22, Pl. 4A, 7B). The cane is of good quality and is used split in basketry. The fruit can be eaten.